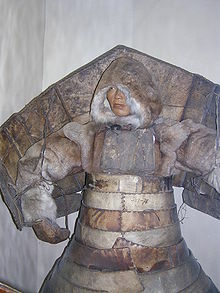 The Chukchi, or Chukchee (Russian: Чукчи, sg. Чукча), are an indigenous people inhabiting the Chukchi Peninsula and the shores of the Chukchi Sea and the Bering Sea region of the Arctic Ocean within the Russian Federation. They speak the Chukchi language. The Chukchi originated from the people living around the Okhotsk Sea. According to most recent genomic research ("Who we are and how we got here. Ancient DNA and the New Science of the human past", by David Reich. Pantheon books, New York, 2018), Chukchi people are the closest cousins of the First Americans in Asia. In Chukchi religion, every object, whether animate or inanimate, is assigned a spirit. This spirit can be either harmful or benevolent. Some of Chukchi myths reveal a dualistic cosmology. In prehistoric times, the Chukchi engaged in nomadic hunter gatherer modes of existence. In current times, there continue to be some elements of subsistence hunting, including that of polar bears, marine mammals and reindeer. Beginning in the 1920s, the Soviets organized the economic activities of both coastal and inland Chukchi and eventually established 28 collectively run, state-owned enterprises in Chukotka. All of these were based on reindeer herding, with the addition of sea mammal hunting and walrus ivory carving in the coastal areas. Chukchi were educated in Soviet schools and today are almost 100% literate and fluent in the Russian language. Only a portion of them today work directly in reindeer herding or sea mammal hunting, and continue to live a nomadic lifestyle in yaranga tents. Russians first began contacting the Chukchi when they reached the Kolyma River (1643) and the Anadyr River (1649). The route from Nizhnekolymsk to the fort at Anadyrsk along the southwest of the main Chukchi area became a major trade route. The overland journey from Yakutsk to Anadyrsk took about six months. The Chukchi were generally ignored for the next 50 years because they were warlike and had few furs. Fighting flared up around 1700 when the Russians began operating in the Kamchatka Peninsula and needed to protect their communications from the Chukchi and Koryak. The first attempt to conquer them was made in 1701. Other expeditions were sent out in 1708, 1709 and 1711 with considerable bloodshed but little success. War was renewed in 1729, when the Chukchi defeated an expedition from Okhotsk and killed its commander. Command passed to Major Dmitry Pavlutsky, who adopted very destructive tactics, burning, killing, driving off reindeer, and capturing women and children. In 1742, the government at Saint Petersburg ordered another war in which the Chukchi and Koryak were to be "totally extirpated". The war (1744–7) was conducted with similar brutality and ended when Pavlutsky was killed in March 1747. It is said that the Chukchi kept his head as a trophy for a number of years. The Russians waged war again in the 1750s. Zolotarjov, A.M. (1980). "Társadalomszervezet és dualisztikus teremtésmítoszok Szibériában". In Hoppál, Mihály. A Tejút fiai. Tanulmányok a finnugor népek hitvilágáról (in Hungarian). Budapest: Európa Könyvkiadó. pp. 29–58. ISBN 963-07-2187-2. Chapter means: "Social structure and dualistic creation myths in Siberia"; title means: "The sons of Milky Way. Studies on the belief systems of Finno-Ugric peoples". Siimets, Ülo (2006). "The Sun, the Moon and Firmament in Chukchi Mythology and on the Relations of Celestial Bodies and Sacrifices" (pdf). Electronic Journal of Folklore. Estonian Folklore. 32: 129–156. doi:10.7592/fejf2006.32.siimets.